It is officially the first week in November, which means that the holidays are just around the corner. 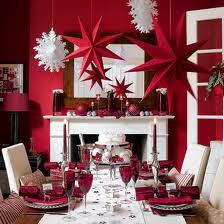 Each Friday until Christmas we will be posting ideas for how you can get organized for the upcoming festivities. Additionally, we are very excited to announce that The Well-Organized Woman will be releasing it’s first eBook on Organized Holiday Planning next week. Please check back then to download your very own copy. The first item on our holiday to-do list is to review our gift wrap supplies. The act of looking through your supplies and determining what you have and what you need is important for two reasons. First, it ensures that you do not buy duplicates of things that you already have. Second, it should serve as inspiration for how you choose to wrap presents this year. If you have a lot of ribbons or bows you could make those the focal point of all wrapping this year. In other words, try to use as much of the supplies you currently have before purchasing anything new. Below are a few additional tips and ideas for maintaining organization of your wrapping supplies this holiday season. 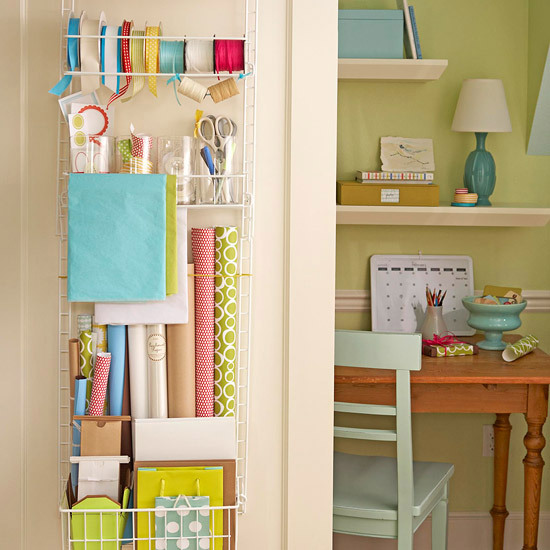 Keep wrapping supplies organized in a portable carrier, such as the Gift Wrap Work Station from Container Store or the over-the-door option pictured below from Better Homes & Gardens. Purge anything that is torn, ripped, or in other ways poor quality. Sort decorative supplies by category. For example, keep all ribbons together, tissue paper together, and bows together, etc. Then sort wrapping paper by occasion, such as all Christmas paper together, all baby shower paper together, etc. This way you know exactly what you have for each potential gift-giving event. Store gift bags inside of one large gift bag. After wrapping gifts, make sure the supplies are returned to their rightful homes. Donate any gift wrap you no longer want but is in good condition to Goodwill – another shopper might love something you no longer use! Halloween may not be one of the most important holidays, but for families with children the day can require much preparation. In order to avoid last minute scrambling, we’ve put together a list of things to get organized ahead of time. 1) Costumes: By shopping for costumes earlier in the month of October you’ll not only have a better selection, but you may also get a better price. Costume stores typically offer coupons in early October, so keep a look out in your coupon mailers or check online sites like retailmenot.com for discount codes for online shopping. For optimum organization, you should aim to have all costumes purchased by the second week in October. 2) Decorations: Halloween decorations can help to get your family and neighborhood in the holiday spirit. Plan on decorating your home and yard by the weekend of October 20th. If you’re carving pumpkins, ideal timing is the weekend before (27th) Halloween to ensure they stay fresh. Keep in mind when you are decorating that the weather changes quickly this time of year, so if you have delicate ghosts or spider webs, be sure to bring them in before any rain hits. 3) Candy: Stores like CVS, Costco, and Target have deals on large bags of candy early in the month, so now is the time to stock up on the sweets you’ll need for trick-or-treaters. 4) School Activities: Schools often plan Halloween activities, such as costume parades and trick-or-treating. Find out the dates of these events now and mark your calendars to ensure your child will be prepared. In addition to the activity dates, also add deadlines for costume and accessory (candy pails) purchases. 5) Trick-o-Treating Plans: Plan on setting up your trick-or-treat plans two weeks ahead of time. If you are coordinating with other families, set a meeting time, location, and plans for child supervision and safety. It’s also a good idea to assign each child a ‘buddy’ to stay with for the evening to ensure no one is left alone. 6) Party Plans: If you plan on throwing a Halloween party, you’ll want to send out invitations the first week of October. During the second week, you can start to plan decorations, food, theme, music, and other party needs. The third week is the time to firm up these plans and finishing buying necessary non-perishable items, such as decorations. 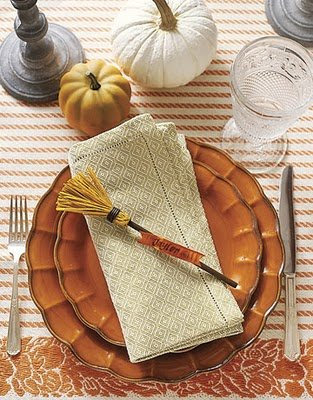 The last week leading up to the party is the time to decorate your space and complete the grocery shopping. On the day-of, you’ll prepare the food and drinks, set up last minute items, don your costume, and get ready to have a spooky evening with friends. 7) Holiday Food: Although Halloween is best known for candy, some people have traditions that include certain Halloween foods. Ensure you’ll be able to make these for friends and family by making a list of foods and necessary ingredients two weeks before the holiday. When making the list, keep in mind the little items, such as spices for pumpkin seed roasting and drinks such as apple cider. We hope that by getting a head start on your Halloween plans this year you’ll have more time to enjoy the festivities on the day of.